Its unusual biological characteristics make the flightless kiwi a unique kind of bird. 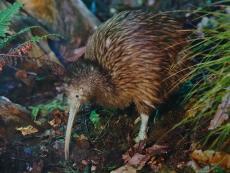 Researchers of the University of Leipzig and the Max Planck Institute for Evolutionary Anthropology in Leipzig, Germany, have now sequenced the genetic code of this endangered species and have identified several sequence changes that underlie the kiwi’s adaptation to a nocturnal lifestyle: They found several genes involved in colour vision to be inactivated and the diversity of odorant receptors to be higher than in other birds - suggesting an increased reliance on their sense of smell rather than vision for foraging. Kiwi have a number of features that make them interesting for study: They only have rudimentary wings, no tail and a very long beak with nostrils. They are mainly nocturnal with a low basal metabolic rate and the lowest body temperature among birds. To date there has been little genetic information available for this species that might help scientists to understand their unusual biology better. An international team led by Torsten Schöneberg of the Institute of Biochemistry of the Medical Faculty at the University of Leipzig and Janet Kelso of the Max Planck Institute for Evolutionary Anthropology have now sequenced the genome of the brown kiwi (Apteryx mantelli). Their analyses show genetic changes that likely reflect adaptation to nocturnal life. Although mutations have inactivated some of the key genes involved in colour vision, the number of odorant receptor genes is expanded suggesting that the kiwi sense of smell is highly developed. These changes happened about 35 million years ago which is after the kiwi’s arrival in New Zealand. DNA analyses of two kiwi individuals show, however, that according to first estimates there is little genetic variability in the population. This could further endanger the survival of this species and will have to be taken into account when planning future breeding programs. “The genome of the kiwi is an important resource for future comparative analyses with other extinct and living flightless birds”, says computational biologist Janet Kelso of the Max Planck Institute for Evolutionary Anthropology. The kiwi is the national symbol of New Zealand and belongs to a group of birds called ratites that also includes the extinguished New Zealand moa as well as flightless birds like ostrich, emu and rhea. Following human migration to New Zealand around 800 years ago, many of the local bird species became extinct. Despite intensive protection efforts the kiwi is highly endangered. Jellyfish start out anchored to the sea floor, just like corals and anemones. Researchers recently uncovered which genes allow jellyfish to graduate from this stationary stage and swim off into the sea.